We did promotions in the simplest and old-fashioned way today. 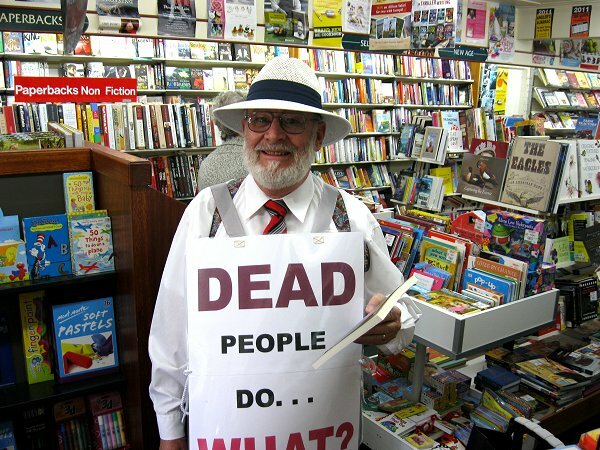 Using a Sandwich Board and a promotional call to Angus and Robertson’s Bookstore. It was actually a pleasure to find a bookstore still in operation. The Proprietor was my photographer in these un-staged shots in the store. I had previously visited the bookstore, while the promotional Print Copies of the book were still in transit and promised to call back when they arrived. In fact, during the interim I spent four admissions in hospital, dealing with arm surgery to replace the top of my right arm and treatment also for six broken ribs and a split sternum. The time has come to begin promotion of DARK-Millennium 3 and one place to start was in my own city. It was interesting to see the reactions of the public. The text on my sandwich boards was quite simple and intentionally ‘leading’. I live by choice in a conservative part of the world. Values here are not simply those of a materially blessed community, between beautiful sun-soaked beaches and a lush hinterland, but quite closely connected to the Pioneer roots of the early Settlers. A number of individuals and couples declined to be drawn on the subject of my sandwich board. It was plainly too controversial and intimate for them. Death can be a taboo subject among those of an innately conservative nature. I loved her. Very typical, not of average Sunshine Coasters but of the obvious End-Of -Worlders, she was quite slender, dressed all in black with pale, un-tanned skin and very pronounced red lipstick. Black hair, of course, regardless that she was ‘past middle age’. A darling really but not to be argued with. She knows she will go up on October 14th. As I strolled past the movie cinema (it’s school holidays) a young woman dashed down the steps from her mother’s side and from the gathered youth waiting to go in. Her eyes were so very alive. 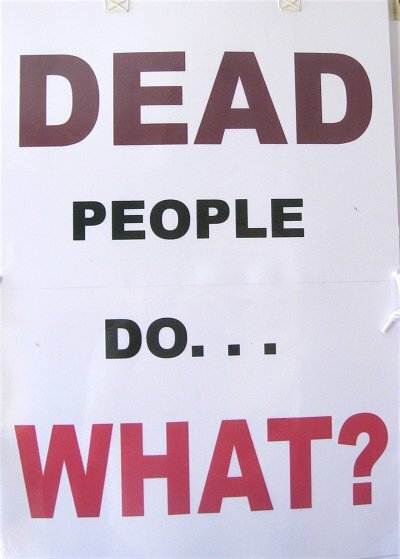 She laughed and demanded to know what dead people DO? I gave her a copy and said she should read and find out. As my “guestimate” of her age was at least fifteen I feel confident no harm can come from reading the book. Given the common practice of such things as partial birth abortions and pre-birth gender pre-selection etc., I think DARK holds no horrors greater than the truthes of everyday. “Mom, I got a free book!” She called, as she dashed back up the steps. It saddened me though to encounter the number of persons who called out to me as I passed that death is the end of it. “Push up daisies; Rot in the ground; Do nothing”. What a pity. We do still live in a predominantly Christian society and yet, as the truth fades from before their eyes, the light fades from their minds. 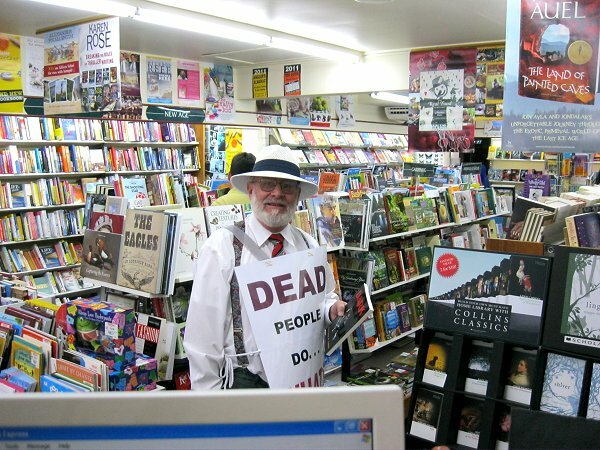 Obviously, a number of people presumed I was that typical sort of street preacher peddling a private version of Life, Death and Everything. Their frank disinterest was plain to be seen but this is the point about DARK. Those who do not thirst in Mortality, for Light, Knowledge and Truth will, when they pass through the veil, find themselves still in the dark. Those who cannot see the darkness that surrounds them in mortality will be no wiser at the instant of their death. Likely they will be also disinclined to accept the invitation of any Guide beyond the veil. Regardless that these matters remain true, the purpose of today’s outing was instead, to promote awareness and sales of the book. Also to bring attention to its Author. Predictably, as I went about I encountered some who know me, either passably or well and they were very happy to get free copies of DARK-Millennium 3. “If you enjoy it, tell your friends. If you don’t like the book, tell your friends you HATE it!” I work on the basis that any publicity is good publicity. Work continues on FORTH-Millennium 3, the second volume in the Trilogy. For now, I need to put further, consistent effort into pushing Book 1. It would be good to organise a Book Signing at the larger end of the Coast, probably somewhere in the Maroochydore Plaza. Noosa Junction would be a fruitful venue also. At Noosa, where they regard themselves as a permanent artists colony, I will likely not get a punch on the nose but a severe ear-bashing! They have Bookstores up there too. 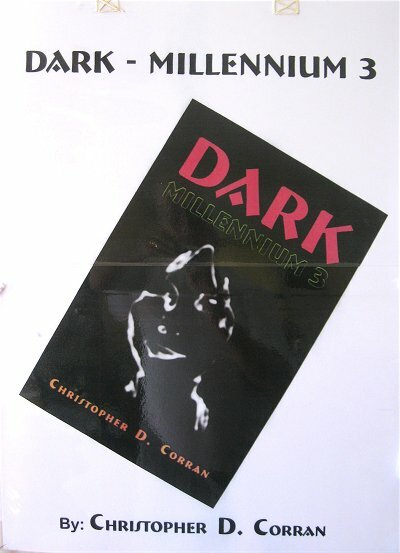 This entry was posted in Chris and tagged After Death Experience, bookstore promotions, Christopher D Corran, DARK Me3, DARK-Millennium3, fantasy religion, spiritual. Bookmark the permalink.